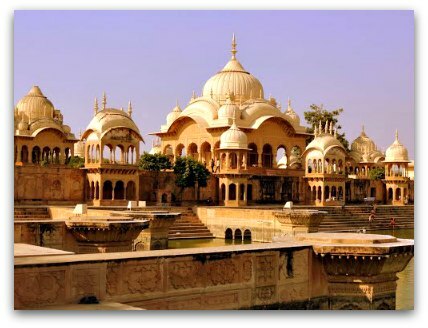 Mathura is considered a holy city in northern India’s Uttar Pradesh. 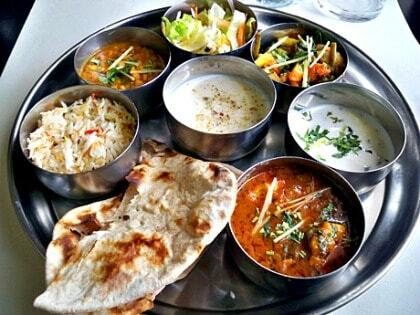 It is also famous for being the native land of Lord Krishna, an incarnation of God Vishnu. During the festivals of Krishna Janmashtami (Lord Krishna’s birthday) in August/September and Holi (the Festival of Colors) in February/March, numerous pilgrims converge towards the city which is one of Hinduism’s seven sacred cities. Along the stretch of sacred Yamuna River which flows through Mathura, there are 25 ghats (flights of stairs leading to the water) where many people take their early morning holy dip. After sunset, the aarti ceremony (devotional chanting and prayer time) is accompanied by sounds of drums beating and the brilliant clashing tones of cymbals; an atmosphere conducive to give you goosebumps! Buddhism was once prominent in this holy place. Later it was attacked by the Afghan and Mughal rulers. Today Mathura is much influenced by Hinduism. Shri Krishna Janmabhumi Temple - It is believed that within the temple premises lies the prison cell known as "Garbha Griha;" the very spot where Lord Krishna was born during the imprisonment of His parents Devaki and Vasudev. Dwarkadhish Temple is the center of activity during Holi, Janmashtami and Divali. The celebration of these festivals may span over several days. Gita Mandir has an amazing architecture accompanied with beautiful carvings and paintings.The whole of Bhagavad Gita (the Hindus’ sacred book) is inscribed on the temple's walls. Vishram Ghat is the most prominent among the twenty five ghats in the town. According to legends, it was here that Lord Krishna took rest after killing Kamsa. For more information about Vrindavan Tour or booking, send us a private message on our Facebook page. Click here >> , or use the Contact Form. It is said that the entire surrounding was once a tulsi grove. The Raas Leela part of the Hindu scripture Bhagavata Purana narrates Krishna’s dances with the gopikas - a group of cow herding girls, in the forest of Vrindavan. Radha, often refered to as Radharani stands foremost out of the group to hold a place of high reverence and importance in many Hindu religious traditions. She is almost always depicted alongside Krishna and is considered the Shakti (the personification of divine feminine creative power) by the Vaishnava traditions. The traditional story also recounts the childhood pranks engaged by Krishna along with his brother Balarama and cowherd friends in the forest of Vrindavan. Govinda Dev Temple - Madan Mohan Temple - Jugal Kisore Temple (Kesi ghata temple) - Sri Ranganatha (Rangaji) Temple - Banke Bihari Temple - Radharamana Temple - Radha Damodara Temple - Sri Radha Gokulananda Mandir - Radha Vallabha Temple - Radha-Syamasundara - Sri Gopesvara Mahadeva Mandir - Jaipur Temple - Shahji Temple - Imlitala Tree Temple - ISKCON Temple ( Krishna Balram Temple ) - Prem Mandir - Garud Govind Temple - Vaishno Devi Temple. Goverdhan is not only a key pilgrimage centre in India but is also reputed for the Holy Goverdhan Hill and the 21 kiometres long Parikrama (the circumambulation of sacred places in Hinduism) of the Hill. On the Guru Poornima festival, which is celebrated by Hindus to pay ritualistic respect to spiritual teachers, numerous pilgrims converge towards Goverdhan to perform Parikrama of the Hill. The festival is celebrated on the full moon day of the June-July month. The Hill is closely associated with Lord Krishna protecting the farmers of Vrindavan from the wrath of Indra, the Deity of rain and thunder, and ultimately defeating the latter. According to the story Lord Krishna convinced the farmers not to pray or perform ritualistic sacrifices for natural phenomenon. He purported that they should concentrate on farming and protection of their cattle rather than carrying huge preparations and offering to Indra. When the ceremony was not performed, the rain and thunder Deity got into a spree of anger and flooded the region for seven days. Boy Krishna responded to Indra by lifting Mount Goverdhan and under which all people and animal came to take refuge. Indra finally accepted defeat and accepted Krishna as the Supreme. On the day after Diwali, Goverdhan Puja is performed to celebrate Indra’s surrender to Lord Krishna. 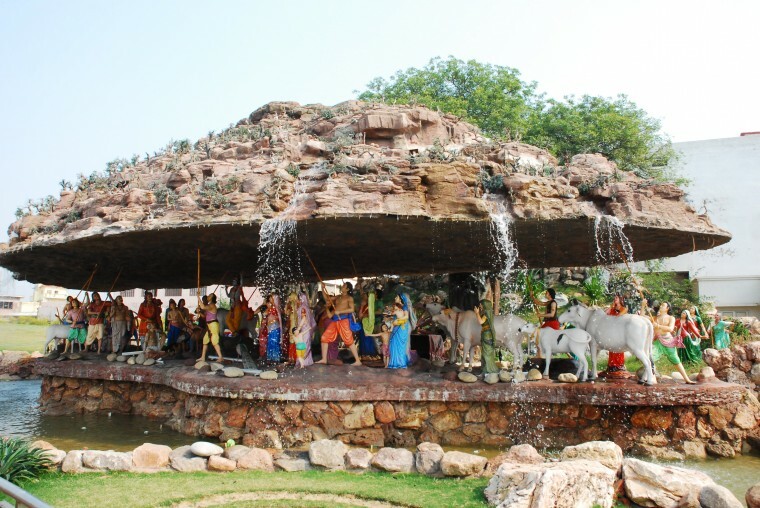 A replica of Krishna lifting the Goverdhan Hill to protect the people of Vrindavan at Prem Mandir. Daan-Ghati Mandir - Radha Kunda - Manasi Ganga Kunda - Kusum Sarovar - Haridev Mandir. Nandgaon is closely associated with Lord Krishna’s childhood and known as the home of Nanda Maharaj, the village chieftain and Foster father of Krishna. According to Indian beliefs, Krishna resided here from the age of seven to ten. Nanda Baba built a house atop a hill to protect Lord Krishna from the demons sent by King Kamsa to kill Him. Nandgaon is a major religious and tourist destination owing to its association with Lord Krishna. 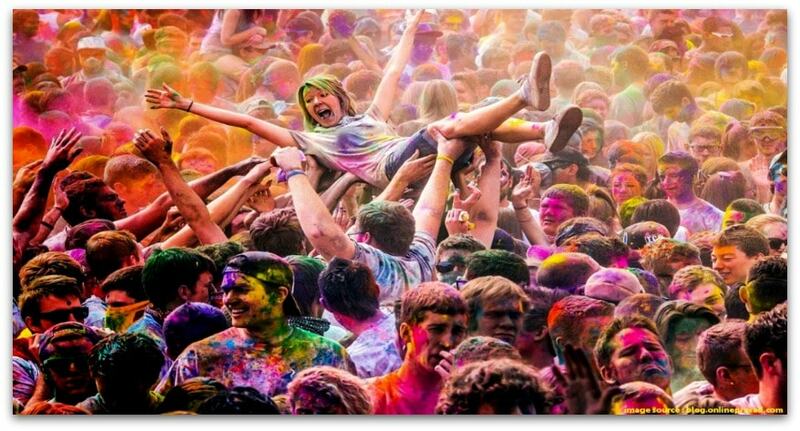 Every year and especially during Holi there are a lot of cultural activities where numerous persons gather to celebrate the festivals. Pavana Sarovara, the place where Mother Yasoda would take Lord Krishna to bathe. Charan Pahari where there is the impression of Krishna's feet. The cow herding village of Gokul is the place where Lord Krishna, according to the Bhagavad Purana, spent his childhood. He was raised here by his foster parents Nanda Maharaj and Yasoda while his birth parents were imprisoned by King Kamsa in Vrindavan. Nanda and the villagers moved from here to Nandgoan following unrest caused by demons sent by Kamsa to attack Krishna. During Krishna Janmashtami, grandiose festivities are organized in the town. Shri Thakurani Ghat - Nanda Bhavan - Raman Reti - Vitthalnath Temple - Brahmaand Ghat - Gokulnath Temple. Lord Krishna’s favorite devotee Radharani’s birth place was Barsana which is now a famed pilgrimage place. 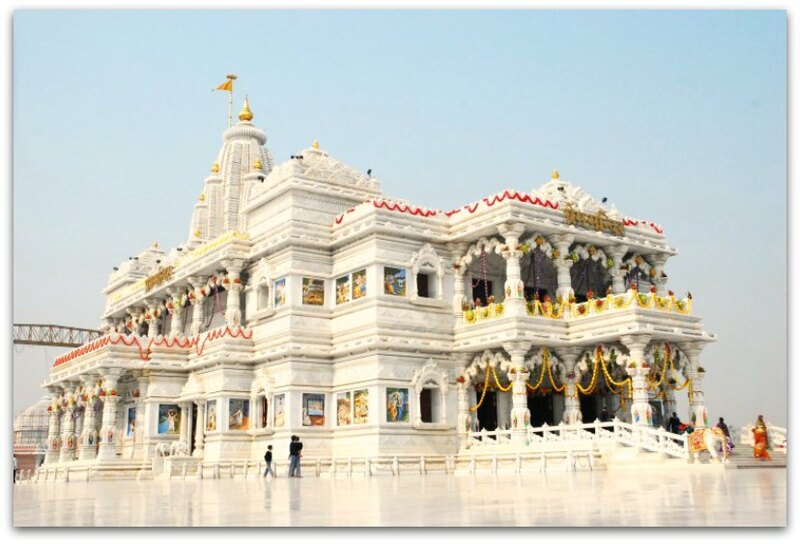 Shriji Temple – The temple was established some 5000 years back and is dedicated Deity Shriji also known as Ladli Lal which means “The Beloved One”, a local reference to Radharani. Maan Mandir - Within the temple, there is a small tunnel leading to a dark hall which is said to be the place where Radharani would go and sit in seclusion, after her disputes with Lord Krishna. Morr Kutir – story narrates that at this place Krishna and Radharani danced in the form of a peacock and a peahen. 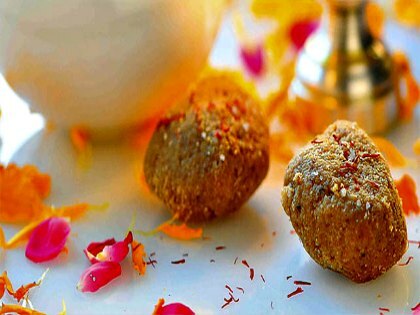 Pure ghee sweets and food are abundant and varied in Mathura and Vrindavan. 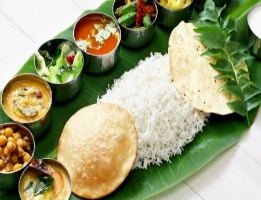 Mouth-watering delicious snacks, tasteful namkeens and nutritious foodstuff can be found all around. For more information about Vrindavan Tour or booking, send us a private message on our Facebook page. Click here >>, or use the Contact Form. Weather and Climate: During summer season, which spans from March through May, temperature varies between 22 to 45 degrees Celsius. Nights are relatively cooler with average temperature hovering around 28-30 degrees Celsius. In winter, from October to February, average temperature is 18 degrees Celsius with peak up to 30 degrees Celsius. Monsoon period is from to July to September. Expect heavy rainfall. During these festivals numerous people travel to these holy places. It is advisable to book hotel accommodation and land transportation well in advance. You may also like. . . . Subscribe to our newsletter and receive free updates on news, stories and travel offers. Don't worry - your e-mail address is totally secure. Follow Us On Facebook. . .
. . . and stay connected with news, stories, comments and targeted offers.